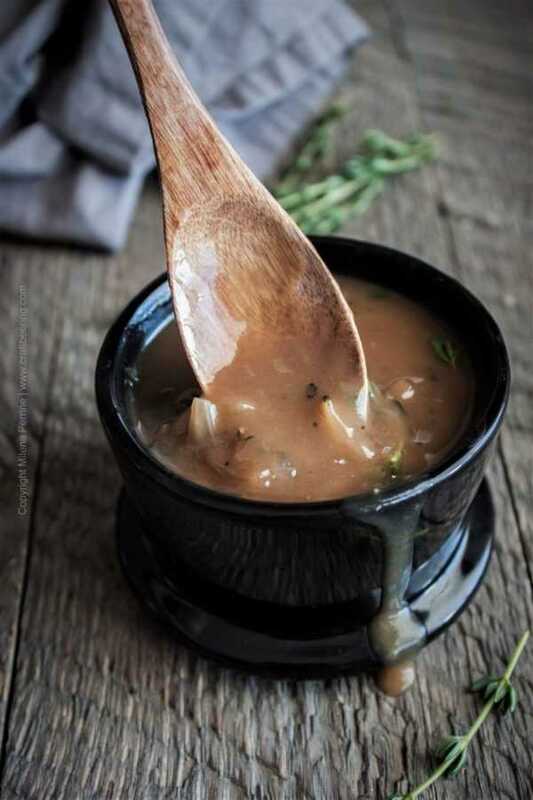 Beer onion gravy, the deeply flavored cousin of regular onion gravy is a much desired partner to many staple dishes favored by beer lovers alike. From bangers and mash to grilled chicken or pork chops and of course – Yorkshire puddings and savory bread puddings. Today we are sharing our very simple recipe and setting the stage for a recipe we will post in the near future for a classic, meaty English staple dish served with onion gravy (wink, wink). Anyone who is even remotely interested in cooking with beer knows of the strong affinity onions and beer have for each other. 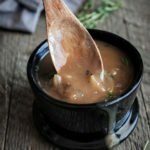 This gravy is also a great way to include beer in your breakfast – just drizzle it over hot biscuits or breakfast sausages. The onions’ caramelization is enhanced by the caramel notes often present in beer styles such as these below. Or the other way around, the point being that cooking onions with beer works and it does so to a very desirable effect. Unless you deliberately want to introduce bitterness to your beer onion gravy, choose a brew with low IBUs and a confident malty character and look for it among the styles listed above. We often make beer onion gravy with porters, which is the case with the batch in the pictures and video of this post. We prefer to leave the tender, cooked down sliced onions untouched. As in we don’t see a need to puree them. 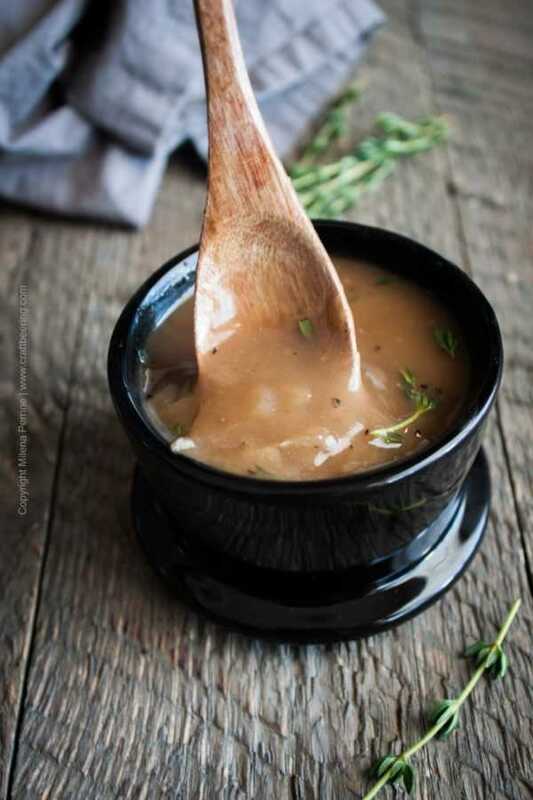 The texture of the much softened onions and chopped fresh thyme and sage against the silkiness of the gravy creates a contrast which we favor wholeheartedly. However, if your preference is for a uniform consistency, by all means do take your handheld blender and puree the onions and herbs once the gravy has finished cooking. The longer you cook down the onions, the better, but that does not mean that the process must take hours. In fact, our recipe barely takes thirty minutes. Watch our brief demonstration using porter ale with very restrained bitterness below. The main steps involved are shown in the video. Then make yourself a batch of beer onion gravy. Cheers, friends! Beer onion gravy is a staple with a number of dishes. Bangers and mash, Yorkshire puddings, grilled chicken, pork chops or portabello mushrooms, even steamed rice welcome its sweet and savory goodness. In a sauce pan over medium heat melt the butter. Add the thinly sliced onions, brown sugar, salt and pepper, sage and thyme and mix well. Cook until the onions are translucent and are beginning to caramelize. Add the flour and stir to incorporate, about one minute. Add the beer, stir and let reduce for a couple of minutes. Add the beef stock, stir and let reduce. In about 7-10 minutes the gravy will have thickened enough. Remove from the heat and transfer to a suitable container. I love gravy! Thanks for the recipe and sharing at #BloggersPitStop. Have a great week! Thanks so much for sharing your post with us at Full Plate Thursday. Have a great week and come back soon! MMMM! Definitely a fan of beer + onions. If only we’d had this recipe at Thanksgiving. Definitely going to save for next year. Thanks so much for sharing at the #happynowlinkup! My mouth is straight up watering all over my keyboard at the moment. 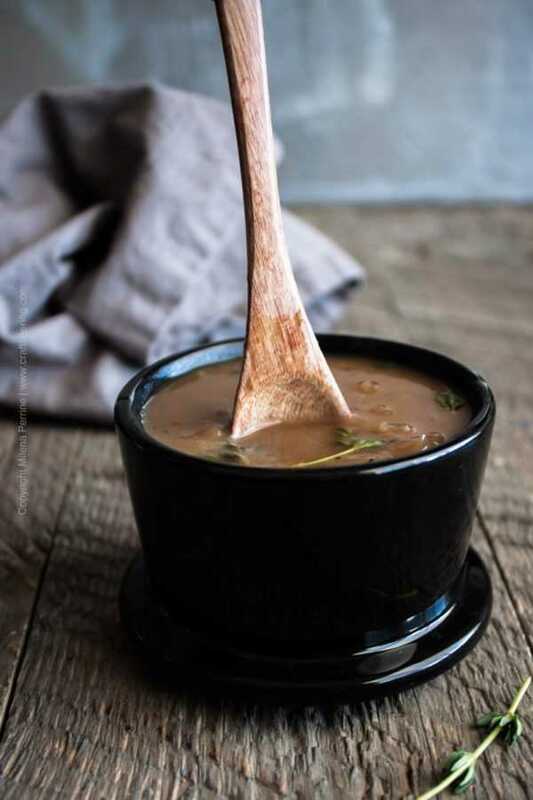 This beer onion gravy looks reDONKulously amazing! Mmm:) It tastes even better than it looks:) Thank you, Christina. Oh yes! A classic 🙂 And I can’t wait to see what this lovely gravy goes with. Thank you, Jennifer:) The partner dish is coming up. I really think I could make a meal out of just this gravy. It looks that good! But I’m definitely looking forward to seeing what you’re serving it with 🙂 Hope you had a great weekend! I am with you, Kelsie. Some freshly baked bread sticks would be perfect to dip in it and it would be enough for dinner. Haha, I find a lot of cute stuff at Goodwill. Thank you, Dawn!